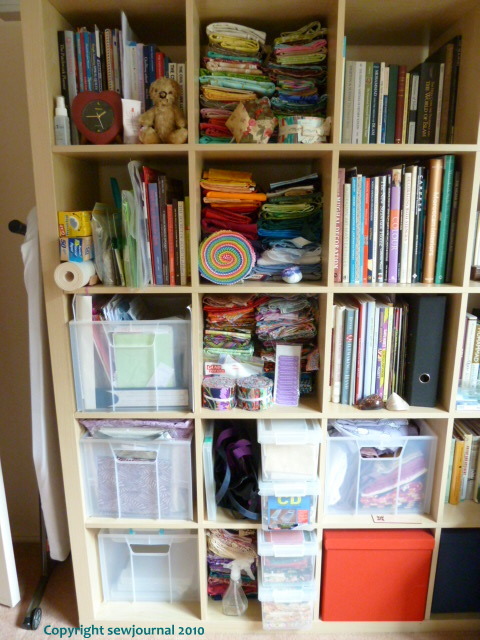 My sewing room re-organisation is finished. I managed to get it done by late Friday afternoon. I’m very happy with the result. 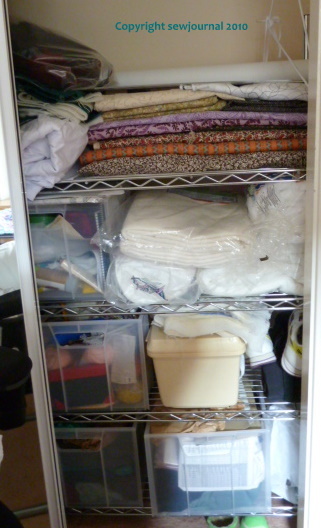 Previously I had stored my fabrics according to colour. Well that just didn’t work for me. I mean look at some of those Kaffe fabrics! What colour are they? There are so many colours in each fabric and usually they’re all shouting “look at me. look at me!”. My fabric bolts are in the wardrobe, together with my whole rolls of batting and crates of other craft things – knitting, painting clothes sewing etc. 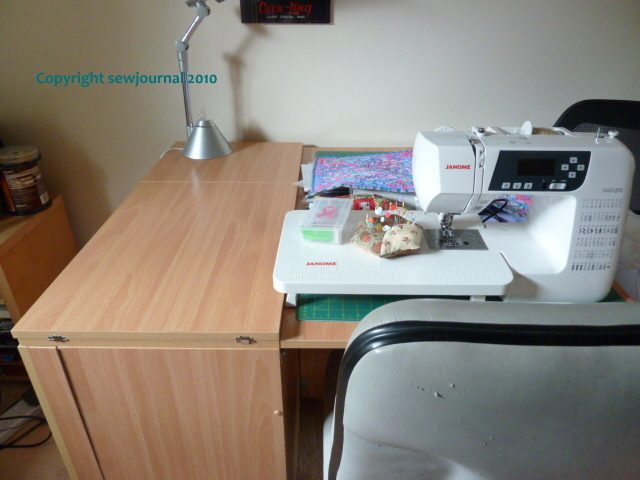 My threads are all in containers in another bookcase and my cutting mat and sewing machines are in/on my Horn cabinet. The only disappointment of this exercise is the fact that while I found the plastic bag and the card explaining its use, I didn’t find my errant Jinny Beyer Perfect Piecing tool. 😦 Oh well you can’t have everything and at least I’ve got a clean and tidy sewing room. It looks very neat and tidy….I wonder how long it will stay that way LOL. Wonderful, I will give you my address and you can come to my home and do mine. I love the look of organization, it just isn’t happening here. Now you can get in there & start something new & mess it up all over again!! I find I dont like sewing until the previous mess is cleaned up, so while the sewing room is never perfect, its tidy & workable. Ive recently put lots of drawers & cupboards in mine which has helped immensly in keeping things in their proper place.